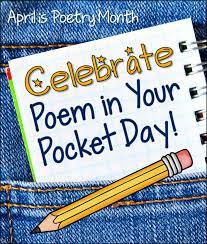 We will be celebrating “Poem in Your Pocket” day on Wednesday, April 17th, 2019, in honor of National Poetry Month. Kids can write their own poem on an index card. Carry your “Pocket Poem” with you all day and read it out loud to at least five people. Ask each of your listeners to sign the back of your card. After you have five signatures on the back of your card, show it to Mrs. Underwood for a special “Poem in Your Pocket” day treat! So many of our kids aren’t yet aware that they like reading & writing poetry, let’s show them!